Prospective students can find a number of criminal justice school options in Missouri, where the needs for legal and protective services is as diverse state’s counties and cities. The Federal Bureau of Investigation recently listed St. Louis, Missouri as the most violent city in the nation with high robbery, assault and murder rates. Students may be motivated to improve these crime rates by enrolling in criminal justice schools in Missouri, as graduates can use their education to protect and serve the community in many ways. From violent crimes to consumer fraud, criminal justice professionals around the state are tasked with ensuring public safety and upholding the law. Learn about how criminal justice school prepares Missouri students for a variety of careers and find what and where the state’s most promising job prospects might be for criminal justice school grads. After Criminal Justice School in Missouri: What's Next? Before committing to a criminal justice school in Missouri, it may be advantageous for students to explore different schools and the programs they offer. Some additional factors to consider may be acceptance and enrollment rates, cost of tuition and class sizes. 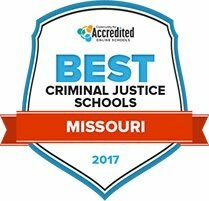 The list below ranks the Missouri’s criminal justice schools and can help prospective students find the ideal fit. Since its founding in 1963 with only 300 students, Jefferson College has grown to serve more than 5,500 students a year with career-focused or transfer programs to four-year institutions. It has now graduated over 25,000 students. The 62-credit associate degree in criminal justice program includes general education curriculum that prepares students who wish to transfer to four-year schools. Coursework includes specialized instruction in criminal justice, criminal law, terrorism, investigations and corrections. The program focuses in providing a broad base of CJ studies, including a required, three-credit internship that includes supervised work at up to four professional settings. Moberly Area Community College offers associate degrees, undergraduate certificates, and certificates of specialization. It also is home to a law enforcement training program and fire academy. The MACC Law Enforcement Training Center was established in 1995 and has been approved by the Missouri Peace Officers Standards and Training (P.O.S.T.) Commission in surpassing the basic 600-hour curriculum. Students can prepare for licensure in as little as 20 months. The one-year law enforcement certificate program also awards 32 credits that graduates can apply toward completing associate degree programs in the future. The training center operates like a law enforcement agency and uniformed students must answer to the chain of command. Founded on its 600-acre campus in Neosho in 1963, Crowder College today is a state community college serving 5,500 students with associate degree and certificate programs. Programs are also available at instructional centers in Cassville, Nevada, Webb City, Jane, Carthage, and Monett. The criminal justice associate degree program is designed to provide direct career training while providing students with the academic credit necessary to transfer to four-year criminal justice or law enforcement degree programs. The 61-credit associate in criminal justice program includes an 18-credit core in criminal justice studies in criminal justice, juvenile justice, corrections, and emergency response. State Fair Community College serves 14 Missouri counties from its home campus in Sedalia and six other locations. SFCC's 5,000 students can pursue more than 65 degrees and certificates, including an associate in arts degree that satisfies general education requirements for students going on to earn a four-year degree. Criminal justice majors can choose an academic pathway to an associate in arts degree to qualify for transfer to a four-year school, or a career-focused licensing preparation program culminating with an associate degree of applied science. Upper level students participate in a supervised practicum in a criminal justice setting. Established in 1922, Mineral Area College has graduated more than 11,000 students at is two-year degree and transfer preparation programs. Today's students can chose among general education or more than 35 career/technical education programs. MAC's AAS in criminal justice program allows students to choose one of five concentrations: law enforcement, correctional administration, forensic investigation, security management, and judicial administration. The two-year concentrations require 66-70 hours for completion and include the general education sequence for transferring to a four-year school. Each of the associate programs includes basic computer literacy training and coursework in criminal law. Students in Saint Louis University's criminology and criminal justice program gain insight into criminal behavior and its causes. Curriculum is designed to engage learners in theory, research, and practice to form a well-rounded professional. In addition to studying criminal offending and victimization, students learn about the law and law enforcement, correctional facilities, and court administration. The program includes opportunities for fieldwork, as well as volunteer work placements in hundreds of local social service and criminal justice agencies. Beyond the standard undergraduate program, students can also take honors courses in criminal justice, or pursue a minor in the field while majoring in another subject area. Missouri Southern State University offers criminal justice students a varied curriculum and a flexible schedule, with day, evening, hybrid, and online course options. If desired, students can complete the program fully online. Class sizes are small, and professors give students individual academic attention. Curriculum imparts the value of community service and an international perspective. As such, those interested in travel or criminal justice outside of the United States can participate in international education opportunities. Criminal justice professionals who are returning to school to enhance their education and career options are encouraged to seek college credit for their work experiences through a portfolio process. With associate and bachelor's degrees in criminal justice and legal studies, Missouri Western State University has a number of options for students interested in the law, corrections, and justice. Aspiring police officers can enter the school's law enforcement academy, which prepares students to work for area police agencies with full-time day classes or part-time evening classes. Students can access support services through the student success and academic advising center, which connects learners with faculty advisors in the criminal justice and legal studies department and disseminates information on resources across campus. Additional services are provided by the center for academic support, which offers tutoring for most courses. Park University combines liberal arts classes with professional studies in its criminal justice administration programs to prepare well-rounded professionals. Curriculum includes criminal law and procedure, as well as research and writing courses. Beyond the degree programs, the school also has a certificate program in terrorism and homeland security that centers on problem solving for terrorist threats and the protection of national interests. Learners in this program study emergency management and preparedness for both natural and unnatural threats and events. Students can pursue the school's bachelor's, associate, or certificate programs in numerous locations across the country, or through fully-online programs. Criminal justice students at the University of Central Missouri are provided with a holistic education that combines classroom work and field experiences. Students learn about management and administration in addition to investigations, forensics, and policing. Many students choose to participate in departmental organizations to round out their educational experience and network with classmates. These organizations include local chapters of the American Criminal Justice Association, the National Criminal Justice Honor Society, and the Pre-Law Students Association, as well as the student chapter of the American Correctional Association. Graduates of the program have a high success rate of job placement with possible positions including security officer, federal police officer, state trooper, and paralegal. Since the field of criminal justice offers many different areas of focus, it can sometimes be challenging for students to find the ideal program. When choosing a criminal justice school, Missouri students should look for programs that will best meet their professional and academic goals. Streamline this process by using the search tool below to compare information such as tuition, student population, degree levels and program concentrations. Upon successful program completion, graduates may have the option to enter into a competitive job market with substantial financial opportunities. Prospective students looking to study criminal justice can use the chart below to see popular occupations in the field along with employment and salary rates for professionals in Missouri. Students who want to work in Missouri after graduating from criminal justice school may benefit from knowing what kinds of opportunities are available to them. Criminal justice professions in Missouri may pay lower than national averages, but job growth projections for many occupations are higher than the national averages. With a lower cost of living in the state, those considering criminal justice school in Missouri can look at the charts below to determine the type of income they can expect compared to their expenses, and see which degree level is necessary to land each position. Those who want to study criminal justice in Missouri field have a number of educational decisions to make that will impact their careers, including what program to enroll in and what area of the field they should concentrate their studies on. But another important factor for a successful career is location. The following table provides data on where the most criminal justice jobs are in Missouri, as well as information on organizations where graduates may find employment. An organization for in-house business attorneys and corporate counsel in the St. Louis region of Missouri. The group offers free programs on a full range of topics surrounding business compliance and provides networking and job opportunities for those interested in the field of corporate legal counsel. Forwarding business initiatives in the state of Missouri, the Chamber of Commerce and Industry is involved in legislation, workforce advocacy and business reforms. The Chamber’s Legal Foundation was established to support businesses in legal, judicial and legislative affairs. This agency supports the growth of businesses around the state and provides information about factors that impact Missouri’s economy. From business services to records and archives, administrative rules and the state library system, those interested in business compliance may find helpful information on Missouri’s state business regulations on this site. This organization advocates for the safe and fair incarceration, rehabilitation and re-integration of juveniles in the correctional system. Students can find information about their mission and approaches to improving the youth correctional system here. The Missouri Corrections Officers Association provides educational and advocacy support to corrections professionals. The group offers a college scholarship for family members of association members. This organization works to reform the criminal justice system and reduce crime by educating and advocating for Missouri citizens, and incarcerated individuals and their families. They list their current issues, resources and proposals on their website. For information on the corrections system in Missouri, including probation and parole, correctional facilities, and rehabilitative resources along with laws and regulations for correctional employees to follow, visit this site. They also provide an online brochure on careers in corrections in Missouri. To promote student education, the Missouri Department of Corrections has established volunteer and internship learning programs at its correctional centers, community release and supervision centers and parole and probation district offices. The Missouri Association of Drug Court Professionals’ website provides news and resources for those who work in Missouri’s drug court and information to help others learn more about the system. This site includes the latest information about what’s going on in the Missouri courts and court cases, and has a collection of valuable education resources. An interactive competition for Missouri high school students where local legal and justice professionals mentor participants as they carry out a criminal investigation all the way through trial in court. Winners also receive a college scholarship. This association aims to maintain uniform procedures across the Missouri justice system. They also provide information on laws and association sponsored events, and provide templates for operating orders for those interested in a more in-depth look at courtroom practices. This website allows Missouri citizens and voters to learn about judges in the state, as well as processes within the court system. A membership organization promoting equality of women in society and within the legal profession. The group hosts many networking and educational events, has a job postings section and sponsors a student scholarship and Board of Directors Liaison program. This legal association provides scholarships and continuing education opportunities for Hispanic students pursuing legal education. Group members serve as a voice for the Hispanic community in the Missouri state legislature and with a variety of local government agencies and community groups. A non-profit organization established to unite judges, attorneys, professors, law students, paralegals and other members of the legal community promoting networking, solidarity and support for the LGBT community. The group also works on initiatives to empower LGTB students to pursue careers in law. Composed of Asian American attorneys, judges, professors and students, the MAABA supports the Asian American community and legal initiatives across the state. The group also offers a mentorship program for members. This site details the services provided by the Attorney General’s office, including its work on criminal, consumer protection, public safety and Medicaid fraud cases. There is also information on state laws and publications about legal issues that impact the state. Low-income Missouri residents can receive legal help from this organization along with information regarding their individual rights. Legal professionals have access to meetings, news, publications, and continuing education courses through the Bar Association. This site has information designed to keep the public safe, such as home safety tips, scam warnings and travel advice. The Missouri Department of Public Safety’s website details information about protection services such as police, fire and highway patrol. Information about safety processes and training programs are listed on this website. This Missouri ATC is responsible for enforcing laws related to tobacco and alcoholic beverages, as well as collecting taxes from the sale of these products. Information about taxes and licensing can be found on their website. This website provides information on the work of the State Highway Patrol, including its different divisions, enforcement jurisdictions and programs and services. Those interested in careers in policework can get more information on job opportunities from this St. Louis County Police Department Career Information page. This agency is charged with sustaining and improving wildlife resources around the state. Wildlife and environmental conservation strategies and laws can be found here. Missouri DOC Archive, Want to Be a Conservation Agent? An archived article detailing requirements for becoming a conservation agent and enforcing Wildlife Code in Missouri. Updated job postings, internships and volunteer opportunities can be found at MDC Online. From information on regulations to compliance assistance, permits and conservation program details this Missouri DNR Enforcement Department page has many resources for those interested in exploring environmental law enforcement initiatives in Missouri. The State Park Rangers’ website includes information on park rules and regulations, the authority and jurisdiction of park rangers, employment information and more.